These Are The Creepiest Coffee..
What's Really Going On Inside .. Even as I pop in for a coffee on a Saturday afternoon the place is fairly full, with a few spaces available at the main “co-working” table – a long table with individual outlets at each desk area. A sleek and modern black couch faces the window and looks out to the street. Two French men are sitting there, one with an open a computer and the other with a stack of loose papers filled with notes. From the looks of it, they’re doing some web startup, or at least I secretly hope that they are because it fits the vibe of this place. The concept at Cafe Craft is simple: it’s 3 euros/hour by “consumption or connection.” Basically that means if you buy one café filtre for 3 euros but stay and work for two, you’ll still get charged 6 euros. Which means you probably should just spring for a baked good to eat with that coffee. There’s a larger space in the back known as the “salon” which is essentially set up to serve as a work area for larger groups or if you have a meeting. As a friend recently put it, “I have a co-worker that comes in from out of town, and he’s always a loud talker on phone calls, so I am afraid to take him anywhere else.” Good to know there’s a place for those types. Cafe Craft serves coffee Cafe Lomi, roasted just a few arrondissements away in the 18th, and made on site in the shiny matte black La Marzocco FB80 espresso machine. They’ve got the require Anglo-inspired baked goods that seems to be the fuel of coffee culture in Paris: muffins, cookies, and yes, even bagel sandwiches. But don’t worry, even if you’re not working, you’re still welcome. Located in the hip Canal Saint-Martin neighborhood, it has become a popular spot with locals and tourists alike, and with all the freelance action coming in and out of here, you’re sure to find some inspiration, modern or otherwise. 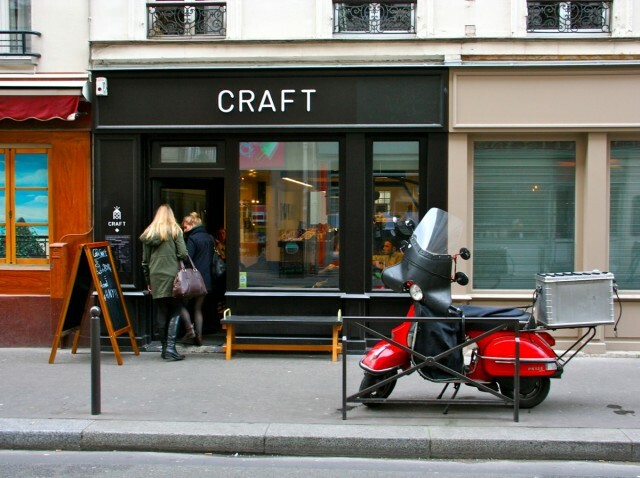 Cafe Craft is located at 24 Rue des Vinaigriers, in the 10th arrondissement. Details via their official website. Anna Brones (@annabrones) is the founder of Foodie Underground, and a contributor to The Guardian, Cheek Magazine, Thrillist, and The Huffington Post. She is the author of The Culinary Cyclist, with a cookbook due out next year from Ten Speed Press. This is her first feature for Sprudge.